Always looking for more help with stabilizing my painful SI (sacroiliac) joint, I stumbled upon a book with a do-it-yourself (DIY) approach to myofascial release. The somewhat challenging book, “Becoming a Supple Leopard” by Dr Kelly Starrett, gave me a quick immersion into an aggressive approach to releasing trigger points or knots in muscles and fascia, fascia being one type of connective tissue. I’d always assumed that tissue imbalances were at least a contributor to my SI pain so, even though there was no mention of SI’s in the book’s index, I launched into my self-directed treatment program targeting dense and bound tissues throughout my body. My initial assumption proved to be correct: along the way I’d be doing releases that would at least indirectly improve my SI comfort, if not directly. 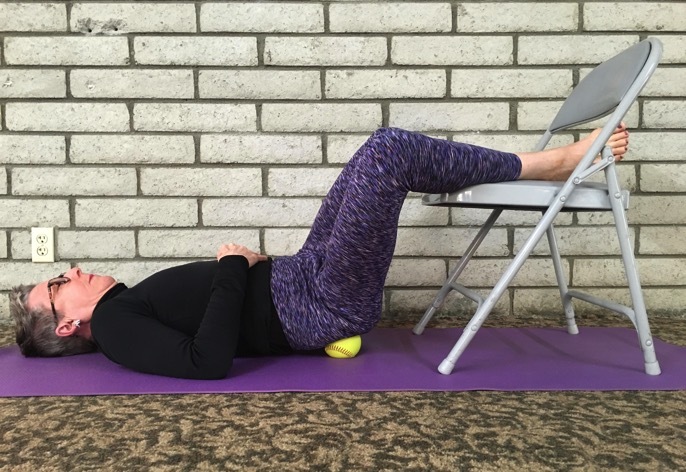 The releases noted below that I am using to aid in healing my SI joint dysfunction came from Starrett’s book, a private session with a Palm Springs practitioner who teaches myofascial release, and trigger points that I found described online. All I needed for SI joint-related myofascial release work. All of the releases that I suspect support my SI joint health are done on the floor and require simple, inexpensive aids. 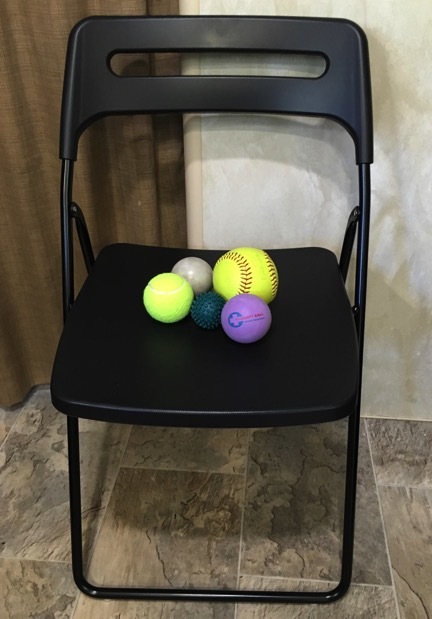 To experiment with these technics you’ll need a chair or foot stool; a softball; a tennis ball; and a lacrosse ball. After about 2 months of doing myofascial release with these items, I did buy a “Yoga Tune-up Ball” specifically designed for the tissue remodeling work. About the size of a lacrosse ball, it has a dense core wrapped with a softer, tacky outer layer that was a welcome intermediate product between the lacrosse ball and a much more compressible tennis ball. You are in search of pain when you do myofascial release—pain is your best indication of knotted muscle or fascia in need of care. Position yourself so you can use your body weight to apply intense pressure to the target tissue with a ball. Don’t apply direct pressure to your spine or your lower ribs; be cautious when working directly on joints and bones; and stay away from skin wounds or irritation. When I work an area for the first time, I usually start with a large ball to modulate the intensity. If there isn’t any soreness or tenderness in an area that I suspect has “issues”, I’ll then move down to a smaller ball for deeper and more precise pressure. If there is still no tenderness, I’ll explore the area a half dozen more times in the coming days to assess if the tissues really are clear or if there are deeply buried problems. Rather than quickly rolling back and forth, move slowly or not at all. One classic strategy is to apply constant pressure to a hot spot for 20 seconds or until you feel the resistance melt away. If there is no change after 20 seconds, release and move on. Lacrosse and speciality balls have slightly tacky surfaces to help grab the flesh so you can slowly drag the ball over the tissue, stretching it and holding that tension for a few seconds. You can also slowly wiggly yourself or the ball to create more of a pulsing action against tight tissue. I experiment with the various approaches in a given area then usually settle on 1 or 2 technics for the specific situation. I spend minutes working a small area at a time and know that even a quick-fix will require daily sessions for at least a week. My problem areas have taken weeks of treatment, with 1-2 months being common for entrenched trigger points even though I can usually tell in the first moments that the work is helping. Be sure to breathe fully while applying pressure to an area—breath-holding will only make it worse. Your goal is to encourage the soft tissue to release and breathing deeply helps foster release and relaxation on several levels. You are breaking up “glue” (scar tissue and adhesions) in your tissues and that glue is ever-present and ready to mat the tissues again. You can’t prevent it from happening, the best you can do is to have the tissues re-stabilize in a configuration that is better suited to your activities. It is therefore important to use the muscles in the full range of motion of your lifestyle when doing this work. For example, I was delighted to launch into my ‘remodeling’ project during an interval when I could both hike and bike hard and frequently on demanding terrain. I also seized the convenient opportunity to take a half-dozen Pilates lessons—a totally new activity for me—in hopes that it would place new stresses on my re-arranged tissues for optimal functioning in the future. If you are in an acute phase with your SI joint dysfunction and your low back muscles are painful, working on those muscles may not give you much relief until the inflammation in the SI joint itself settles down. The low back muscles near the spine are an area of “referred pain,” or pain in an area that isn’t the source of the irritation, for SI joint dysfunction. But if those back muscles are still achy once the SI joint tissues have recovered, you may benefit from release work on the back. I certainly benefitted from doing myofascial release on my lower back muscles once my SI joint was healthier. I continued to have a dull ache in my SI joint area and in my low back on the same side. Using a softball, or a myofascial release ball elevated on a book or yoga block, allowed me to dig into and release those tissues. 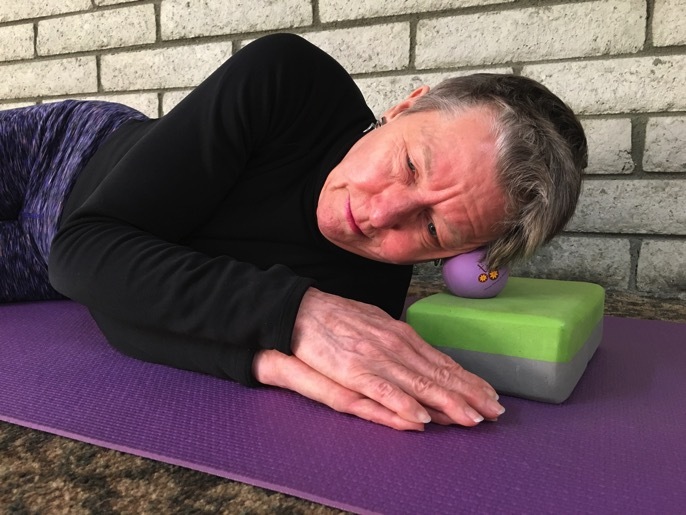 I lie on my back on the ball and usually support my head with a yoga block or firm pillow to prevent overworking the neck muscles while trying to entice the back muscles to relax. I start with the ball at my waist to one side of my spine on the mound of muscle that parallels the spine. I slowly roll up to the mid-back area, then work the ball down to my waist to do a little reconnaissance. I then revisit this path while working the ball side-to-side for 3-4” to massage more of the muscle mass. I then move the ball to the other side of the spine and repeat the work. In my case, the muscles on my left lower back were much more tense than the right side, which fit with my pattern of left SI joint dysfunction. When on your belly, start with the ball on the pubic bone & work it sideways. I found that my low back muscles were well ‘armored’. Initial exploration of the area with a ball elicited “Move along please, there is nothing wrong here.” But with repeated pressure to the area, I eventually was able to sink into the tissues and create release. I’m hopeful that restoring the normal length of and circulation to these muscles so will decrease my SI joint distress by removing the ‘upstream’ pull on my pelvis. And regardless, it’s nice to have alleviated the low back pain. If you draw an imaginary line across the lower part of your pelvis from one side to the other from where your leg and pelvis join, where the leg bends, your pubic bone will be in the middle of that line. The pubic bone is the only structure in the area that is so hard. Lying on your belly on the floor, not a soft surface like a bed, slide a tennis ball or myofascial release ball under your pubic bone. Let your body weight sink into the ball. Proceed with your “search & destroy” mission on the trigger points from the pubic bone towards one leg, then the other. This is a small area that houses the muscle attachments for one of the big abdominal muscles on the pubic bone itself and one of the leg adductors to either side. Sometimes bunched fascia or muscle tissue in this area can contribute to SI dysfunction. Starrett’s acrobatic technic for tackling the upper, outer surfaces of the glutes was an instant success for me—I could tell just looking at the photo that it was spot-on for my troubles. I’d stretched and stretched my glutes and yet still had aches and spasms in them. Trigger pointing them did the trick. I experienced immediate benefit even though I was still working on them daily 2 months later to completely disrupt their pattern of reactiveness. Lie on the floor on your back with your hips and knees bent to 90 degrees and your lower legs resting on a chair or stool. 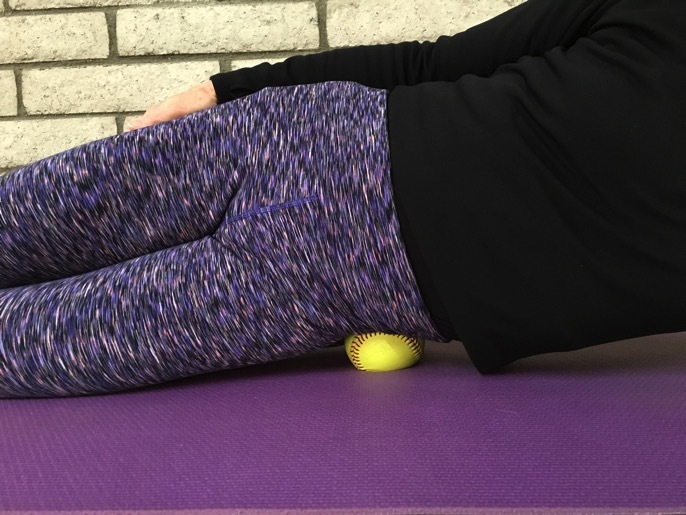 Place a lacrosse ball under your hips near the upper ridge of the pelvis a few inches below your waist to the left of your spine. Keeping the ball in place, twist your lower body sideways a bit so both knees are pointing slightly to the left. Begin slowly rolling your pelvis on the ball searching for painful spots. If it’s too intense, substitute a softball. Rolling on a softball to release the outer glutes. I work the upper pelvis from the midline out to one side and down towards the leg. I roll around in a band about 3” wide searching for tender tissue, pausing when ever I find a hot spot. After exhausting my tolerance for pain or my patience, I move the ball to the right side of my pelvis and flip my knees so they point to the right. Rather than roll the ball, you can also rotate your associated leg to more easily create a similar effect. This release was a game-changer for me. My right glutes frequently went into spasm when on a hard hike and yet I felt no resistance in them when I stretched the muscles. Amusingly, the glutes on the left side would be tight even though they hadn’t bothered me on the trail. Regularly doing this myofascial release gradually disrupted this old pain pattern in my right hip. Working the lateral or side hip area has been very beneficial for me--especially my knees. But it’s also compelling to think that optimizing the functioning of all muscles in the pelvis would be of benefit to my agitated SI joint. I lie on my side on the floor with a softball under my hips and explore the entire swathe of tissue that I can reach from that position, working from near my waist down to the hip joint and a little bit beyond. When the tissues feel clear of densities under the pressure of the softball, I switch to the harsher lacrosse ball to go deeper. The trigger points for the illiotibial band (ITB) of the outer thigh are in this area, which is a bonus. Releasing trigger points on the side of the pelvis. Years ago a massage therapist told me that the pelvis and jaw were linked, that their problems rose and fell together. The comment stuck because I’ve had jaw problems since my 20’s (TMJ Syndrome and teeth grinding) and SI joint pain for as long, but I haven’t ever been able to work with the link, until now. I don’t know that doing my newly learned myofasical release technics for my jaw and head muscles will spill-over into being therapeutic for my SI, but they are doing wonders for my jaw, so I’ll continue with the releases and watch my pelvis with interest. I side-lie on the floor and use a tennis or myofascial release ball on a yoga block to effect the release. Use a thick book to elevate the ball if you don’t have a foam block and experiment with your lower arm in front of you as well as behind. Find the block height and arm position that allow you be stable and comfortable enough to stay there for 5-10 minutes. I’ve benefited the most from working on the jaw joint in front of the ear and roughly following the cheek bone towards the nose. I work both sides of the cheek bone. I carefully move up to the bone at the edge of the eye socket, cross back over to the ear, and then work a 2” wide swathe diagonally towards the top of the head. I progress about 1/4” at a time and find pain at almost every spot along the way. I also dig the ball into the tissues along the lower jaw. When you’ve done enough on 1 side, trace around your ear on your skull with the ball moving towards the back along the lower edge of your skull searching for more tender points, then roll on to your other side to work it. Like working to release the muscle knots and fascia in any part of the body, approach the jaw and skull tissues as a ‘search & destroy’ mission. Go looking for pain and ride with it. I find the dragging or stretching type motions most helpful but occasionally toss in some little circles, pulses, or movement of my jaw in hopes of a quick fix that doesn’t come. You may encounter “armoring” or reflexive protection preventing the ball from sinking into the irritated tissues. If you find nothing that is painful or tense, keep at it for a few days to see if release occurs and you are able to work more deeply. Of course, if you are one of the lucky ones, there won’t be any tissue constrictions. Highly effective jaw work using a myofascial release ball on a yoga block. If you do have “issues," the mysofascial release technics across the jaw, temples, and beyond will provoke nasty pain. I had enough dense, painful tissue that even 2 weeks on, I was still spending 15 minutes a day on each side of my head. It’s baffling as to how such a small patch of tiny, thin, muscles and fascia could be so needy, but they were. Like most of the myofascial technics, I felt profound benefits on Day #1 so eagerly kept at it, despite the irritating pain. I immediately noticed more slack in my jaw, especially upon awakening in the morning, with this work. Perhaps with time, I will also realize in hindsight that my SI joint pain has further diminished. Doing myofascial release work has been a huge project for me and I often spend an hour a day slowly working on dense tissues, including areas independent of my SI joint. It takes persistence and discipline to put in the time and put up with the pain. I press-on knowing that cleaning up ancient knots and densities should largely be a one-time project and then I will move into maintenance mode to retain the ease in the tissues. Revisit tissues you’ve released, even after the hard work is done. I don’t know the answer to the question “How often and for how long?” and can only guess. I’ve tapered from daily work to several times a week for a month or so on the ‘finished’ areas and anticipate touching into those areas once or twice a month for the long term, both to monitor and to support the tissues. You can go to Myofascial Release: DIY PT for more details about my experience with myofascial release.